Natural stone, but not granite — Natural stone in the bathroom is a timeless trend, but granite’s time in the spotlight is making room for other beautiful stones such as quartz. Quartz has an additional advantage: it’s more affordable and less prone to damage. It’s also non-porous which makes it more durable and easier to keep clean. Where granite can often dominate a small space, quartz has a cleaner appearance. Look for quartz countertops, tiles, and flooring. Open spaces, including showers — Roomy bathrooms are in. After all, who wants to feel cramped when trying to relax? Showers and bathtubs are roomier and more open, too. If you have the space for an open shower, go for it! If you prefer an enclosure for your shower, go for glass walls, making your shower an Italian shower! In a smaller bathroom, a glass shower enclosure can both contain the water and give the illusion of a larger space. Freestanding bathtubs — The freestanding bathtub trend is here to stay. It’s a bold and beautiful choice that suits so many styles ranging from vintage to contemporary. A variety of tub styles and shapes are offered as freestanding bathtubs. Because freestanding tubs do not require mounting against a wall, they are often referred to as “island bathtubs.” Don’t forget to invest in a freestanding bathtub filler. An industrial aesthetic — Bare, but simply gorgeous, lightbulbs, artfully exposed pipes, and antique vanities are a few examples of the industrial look that is becoming so popular right now. For homes made of brick, exposed brick walls in the bathroom will fit right in. Bleached wood cabinetry — Bathroom cabinetry trends are changing, too. While white cabinets have long been a go-to choice, bleached wood cabinets add a softer, warmer feel to the room while maintaining the uncluttered look that makes white cabinets so elegant. Bleached wood cabinetry can add an organic touch to a heavily tiled room, providing much-needed contrast and texture. Textured and patterned tiles — The same is true of ceramic tiles. The smooth surface of subway tiles and subway tiles, in general, is giving way to textures and patterns. Look for bold geometric patterns, tiles that mimic the look of wood planks, 3-dimensional tiles, and colored tiles. Rose Gold isn’t just for iPhones — Rose gold fixtures, towel bars, grab bars, and other accessories are making a splash in the bathroom. Other trendy finishes include brass, satin, and the ever-popular chrome. While no-one suggests redesigning your bathroom to match your iPhone, it’s hard to deny rose gold as an elegant accent color. Statement sinks — Show-stopping sinks are another trend for 2018. How can the humble washbasin make a statement? There are several creative ways including the use of natural stone, resin, or color. Freestanding sinks are another attractive option as are vessel sinks that sit on top of a vanity rather than within it. A pop of color, especially blue — Color almost always plays a role in bathroom trends. Some years, it’s all white; others it’s black; blue looks to be the color of the year in 2018. Popular hues of blue for the bathroom include navy, cerulean, Caribbean blue, teal, grayish blue, and robin’s egg blue. Recent bathroom shows have showcased color faucets and color sinks, making adding a pop of color to the bathroom both fun and fresh. Imaginative doors — Finally, the humble bathroom door provides yet another way to update your bathroom to reflect the latest trends. While you could use the door as a canvas for your pop of color as noted above, the hottest bathroom door trends for 2018 go beyond color to include unique details such as inlaid glass, funky doorknobs, carved accents, custom framing. If anything, 2018 luxury bathroom trends are far from boring. At the same time, they are not over-the-top either. Trendy bathrooms this year will be spacious and luxurious with a hint of playfulness. 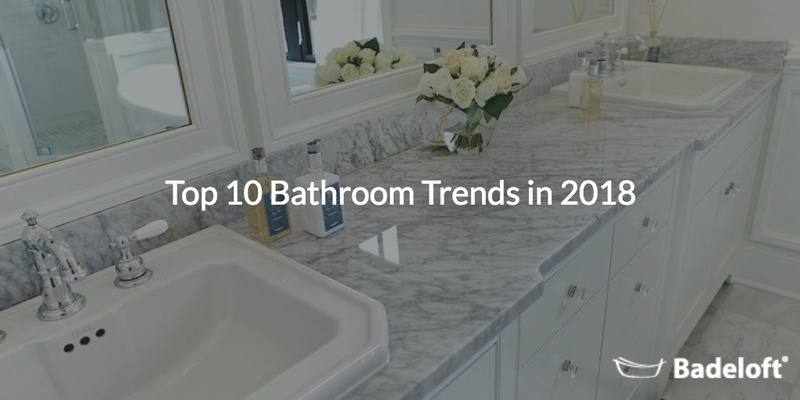 Breathe new life into your bathroom by implementing one or more of these trends.